This ROLL OF HONOUR BOARD which was above the door, adjacent to the stage, in the main hall bears the names of all those men employed at Joseph Hoyle's mill, Longwood who served in the armed forces in world war one. Sixteen of those 200 are marked as killed or missing. The board was taken down during the redecorating of the hall at the beginning of 2017 and it is the aim and intention for it to be cleaned and restored before it is returned to its home above the door. As this year marks the centenary of the end of WW1 and also the 160th anniversary of The Longwood Mechanics Hall it is hoped to have this restoration completed before October. To succeed with tyhis project we need to raise £1,000 to pay for the restoration. To try and do this we need to raise £5 for each name on the board, so if you and your family would like to sponsor one of these named men for any amount from £1 to £5 then please write your name on the large poster displayed on the back of the lift in the hall next to the name of the person you would like to sponsor and place your money in the managers box in the porch. If anyone has any information regarding any of these men (where they lived, their regiment, where they served what they did after the war, direct relations who may live in the area etc.) then please contact Raymond or Christine Collier who are collating this information. A comprehensive folder of information regarding those who were killed or missing is being constructed and this will be available for public viewing in the very near future. Completed in 1861, tradition has it that the tower at Nab End was built by unemployed men during an economic depression to keep them away from the drinking houses, although it is possible that things were so bad that the men worked on the tower so as to receive a small amount of money and a meal. The tower was officially opened on Saturday10 August, the weekend of the annual holiday, this holiday was also known locally as the "Thump". 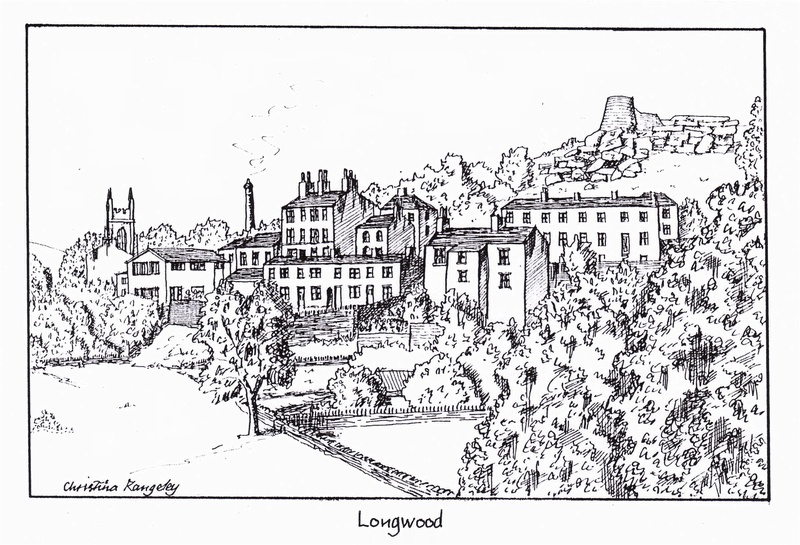 In 1895 the owner of Nab End, Mr G Shaw of Botham Hall, gave the land where the tower was built and the adjacent quarry to the people of Longwood as a recreation ground in memory of Mrs Amy Shaw, her husband and children. This information was inscribed on a bronze plaque fixed on to a rock adjacent to the tower, but this plaque disappeared in 1969 and has never been found. The rivet holes and indentation on the rock can still be seen. At 7.00 am on the second Sunday in August 1873 the first "Longwood Sing" took place, a preacher was invited to attend and a collection was taken to be given to the poor and sick in the Longwood area. Other Sings in other Townships have followed but Longwood SIng, the "Mother of all Sings" has continued annually ever since although it is now held on the second Sunday of September, but the collection is still given to charities in Longwood and the Huddersfield District. The Longwood Village Group have put together a series of walks around Longwood and the surrounding area that explore the history, architecture and wildlife to be found. The three walks all start and finish at the same place but are of different distances and therefore duration. You can plan your day so as to just take in one of these walks or you could do any two or even all three if you are feeling really energetic. A pack containing maps of all three of the walks, with text and photographs pointing out items of interest along the routes, is available for free from the Longwood Mechanics Hall or the Coffee Shop. The pack is also available at local libraries and in some local pubs. If you have any difficulty obtaining one of these packs just contact us with your name and postal address and we will forward one to you. Longwood Mechanics Hall, the home of Longwood Village Group has a long and interesting history having suffered many ups and downs over the years. Now a thriving community building it is the base for many diverse activities that range from Table Tennis, through dance in many forms, to art and martial arts. The activities of the Hall and its general upkeep are the responsibility of the hall managers and a small team of helpers.